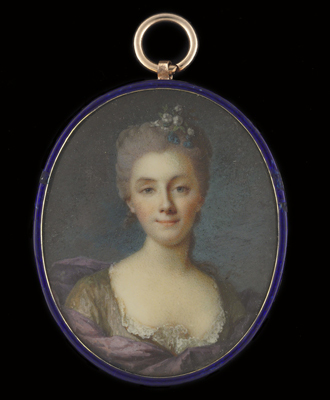 Much in parallel with England, the demand for portrait miniatures in eighteenth century France was also soaring, with some of the finest European artists cutting their teeth on the frivolous French court. Although at present unidentified, the artist of the present work was evidently aware of court taste and more specifically the work of Jean-Marc Nattier (1685-1766), whose compositional ideas are seen reflected here, especially in the prettified face and the slight inclination of the head to the left. By the mid 1750’s Nattier was attempting to divert from the heavily allegorical overtones of his earlier portraits and instead focus primarily on the beauty of his sitter’s faces on a more personal level as seen exemplified in Mademoiselle Marsollier (1757). The bust length format with the sitter depicted full-face is another influence from Nattier which ultimately created a greater intimacy between viewer and subject.